How Load Testing is performed using Apache jMeter? Before knowing about how to perform Load Testing, it is necessary to know what is Load Testing? Similar to Civil Load Testing term, in Information and Technology Load Testing is performed to check how many concurrent users can use the app or website at a time, breaking points, app or web behaviour under load, how the API and other features run under the heavy load and the response time of the Web or App when multiple users are using it concurrently. Load Testing can be performed on various software like jMeter, sung, Gatling and The Grinder. Statistically, it has been proved that Apache jMeter takes the lowest testing time and has the fastest response time with the highest average throughout. Tsung and Gatling perform better than The Grinder, as The Grinder has the slowest response times with the lowest average throughout. 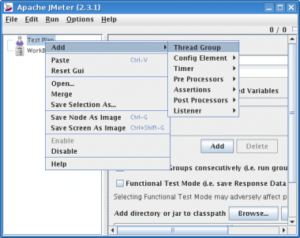 Apache jMeter is an open source framework based on Java. It is designed to test load, performance, functional and regression of any web applications. It is mainly used to test the performance of the various features of the website or app when multiple users are using it simultaneously. 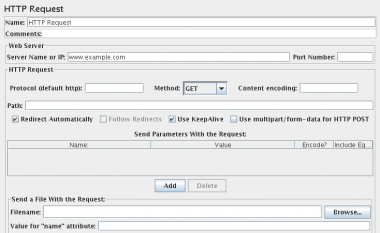 After installing, Apache jMeter browser lets move ahead to the steps how to do load testing in Apache jMeter. Load testing is performed to figure out the behaviour of the web under specific expected load as per requirement docs. A specific load like multiple users accessing the application concurrently. Say, for example, a web application will be used by thousand users at a time. It is called a load on an application, though all the users are not the performing same task. Such Load testing is actually conducted by applying the concurrent load on the application for a specific span of time. The number of users is created virtually by usage of tools to simulate the user action and application response is the measure to judge the performance. Load testing is conducted by applying the above concurrent load on the application for a specific period of time.These numbers of users are created virtually by usage of tools to simulate the user action and application response is the measure to judge the performance. Open on the Apache jMeter software (we are using Apache jMeter version 2.8 on server) and build a basic test plan. Number of Threads (users): The number of user that jMeter will attempt. Set this to 10. Ramp-Up Period (in seconds): The duration of time that jMeter will distribute the start of the threads over. Leave this set to 1. Loop Count: The number of times to execute the test. Leave this set to 200. We probably see that the Status of all the requests is “Success” and indicated by a green triangle with a check mark on it. After that, the columns that you are probably most interested in are the Sample Time(ms) and Latency(not displayed in example) columns.